Our December Kitschen Ckaos recipe is Slow Roast Lamb with Pomegranate, Pistachio and Labna. Our 2015 calendar combines our love of food, photography and design. This year our mouthwatering recipes focus on the delicious world of cheese, so join us on our gastronomic journey of discovery! Combine peppers, salt, paprika, ginger, turmeric, cinnamon, garlic and olive oil in a small bowl. Place lamb in a large roast pan and pour stock into the base. Cook at 220°C for 30 minutes. Remove from oven and cover tightly with aluminium foil. Reduce heat to 160°C and cook for 3-4 hours or until tender, basting occasionally. Place onion in a microwave safe bowl and Microwave on HIGH for 1 minutes to soften. Slice or shredded lamb using two forks and arrange on a serving platter. Top with red onion and generous dollops of labna. Finish with pistachios, dates, pomegranate and coriander. Serve with cous cous. Place a double layer of cheesecloth or muslin in a colander or sieve over a medium bowl. Spoon the yogurt into the muslin. Gather the edges of the cheesecloth together and twist the bag tightly, return to colander. Allow to stand for several hours or overnight in the refrigerator to remove excess whey. Discard whey. Night 1: Crispy five-spice Pork belly with chilli caramel and Asian slaw, grilled salmon, sushi rice, kim chi, Japanese mayo and chilli oil in a tempura nori shell, and to finish off, vanilla bean w/ raspberry crème brûlée. Night 2: Pancake with braised pork and Viet slaw, Indian style nachos - roasted papri chips topped with curried chick peas and potato, beetroot and carrot slaw, coriander and mint chutney and tamarind and date and deep fried gua bao filled with peanut gelato, dipped in milk chocolate sauce and rolled in crushed peanuts. Laura had: Wonderbao bao buns, KOMG BBQ corn and spicy chicken wings, crème brûelée and chicken skewer sticks. Food Envy! Laura won two tickets to the Sunday afternoon session of Sweetfest via. the Facebook competition on The Age - Melbourne Express Facebook page. Whilst she was there, she saw a masterclass demonstration by American Big Gay Ice Cream, who made a ‘choinkwich’ - a chocolate and caramelised bacon ice cream sandwich. She also brought back some delicious cinnamon scrolls to share at the Ckaos studio. YUM! Laura and Lilly have been exhibition hopping again, this time venturing to Collingwood where they viewed Melbourne artist Kat Macleod's mixed media show, Under Nightshade. Other then co-running a successful graphic design studio, Macleod is know for her pretty, mixed media works and commercial illustrations. 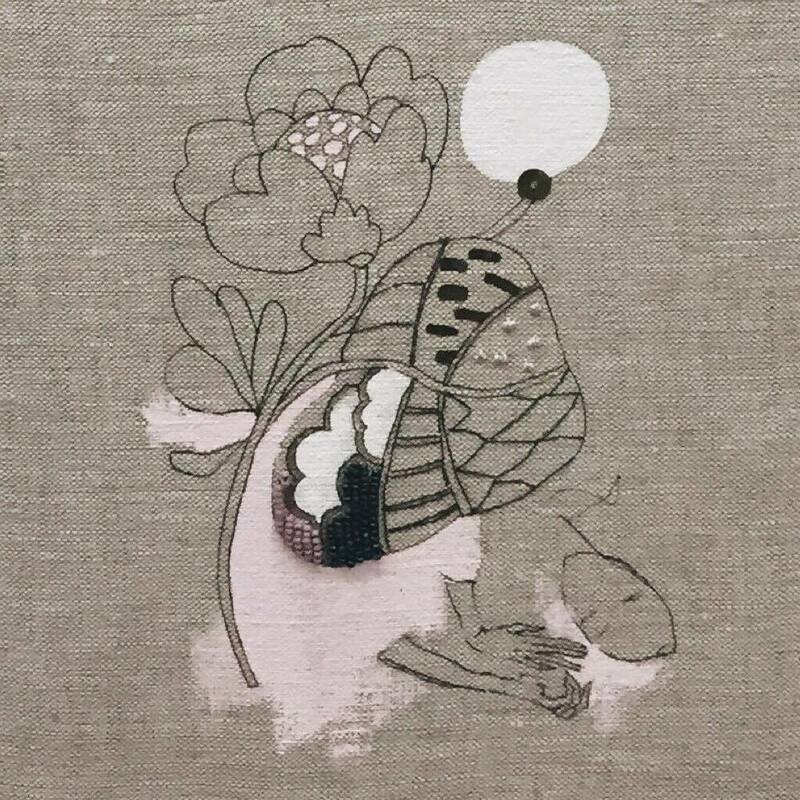 Her latest solo exhibition is inspired by deep sleep, comprising of mixed media works on linen, combining a distinctive mix of gouache, watercolour, hand stitched embroidery and beading. She was inspired by the botanical, world as a means of expressing how sleep can be beautiful, clam, quiet, enchanting, unreal, unpredictable, weird, dark, wild and elusive. What better way to spend a sunny spring day than at the Zoo! Cam recently ventured along to check out some of the wildlife. This month has been huge for live music at the Ckaos studio! Laura and Lilly recently went along to one of Florence + The Machine's sold out performances at the Sidney Myer Music Bowl. Florence Welch has been regarded as one of the most dynamic live entertainers on the planet. Since her performance at the Splendor In The Grass Festival earlier this year, her return to our shores has been eagerly awaited. And this time around, her performance certainly didn't disappoint! The girls said the show was like nothing they had ever seen before, describing her as “electric” and “goose-bump incredible”. Another international act to grace our shores this month was British rock band Mumford and Sons, performing their biggest local show to date at the Sidney Myer Music Bowl. Eleni and Laura attended the performance and said it was a fantastic night.